The Beatles said "All you need is love," and then they broke up. There is a very interesting paradox in the New Testament. One one hand, you see rapid growth of the church and the dogged evangelistic determination of the Apostle Paul. On the other, there is virtually no practical instruction on how to do evangelism. What are we to make of the clear imperative, articulated in the Great Commission (Matt. 28:18-20), to win the lost, combined with the lack of direction within the Epistles on ways in which to accomplish this? It is sometimes suggested that in the early church, this wasn't a problem--that the early Christian believers were filled with a fervor that most of us no longer have, that if we could just regain this excitement and enthusiasm, we would spontaneously share our faith with others as well. There was no instruction because no instruction was needed. It seems incomprehensible to me, however, that out of all the problems and heresies that the New Testament epistles were written to combat, nobody seems to have had a problem with a failure to share their faith. Whatever the reason is that the New Testament doesn't really address how to evangelize in a practical way, it isn't that all the New Testament believers were already doing it too well to need any assistance. What the epistles do give us is clear instruction on how to live and how to relate to one another. The Apostle Paul discusses his own missionary endeavors quite freely, but what he encourages his readers in is the living of life in a godly manner. He deals with various churches on social and economic divisions, as well as those based on competing claims to follow different teachers, marriage and family relationships, slavery, differing convictions regarding disputable matters, lawsuits, sexual immorality, deceit, and many other practical matters. Paul's primary concern for the believers in the churches he writes to is that they live godly lives that reflect Jesus' command to love God and to love others--that their lives will bring glory, and not shame, to God. When he writes, "Do the work of an evangelist" (2 Tim. 4:5) he is writing specifically to Timothy, not to believers in general. What I am suggesting here is a difference between evangelism and being a witness. "Being a witness" is much larger and much more life-encompassing than what we generally term "witnessing. "The command to "go and make disciples" was given not generally, but to the eleven disciples remaining after Jesus' resurrection (Matt. 28:16-20). Interestingly, even the Apostle Paul stated that he was called to "preach the gospel" (εὐαγγελίζεσθαι, related to the English "evangelize," 1 Cor 1:14-17) rather than to baptize, even though baptism had been part of the Great Commission. But Paul's primary concern for the people of God was that they would show the love of God to one another and to outsiders (e.g. Rom 13:10), and that they would conduct themselves in a manner that would bring credit and not shame to the name of Christ (e.g., 1 Cor 6:5-6). In this, he is giving practical content to Jesus' command to "be my witnesses" (Acts 1:8). "Being a witness" is much larger and much more life-encompassing than what we generally term "witnessing." It is living a life that itself witnesses to the reality of God's presence within us. It is only by doing so that we gain a hearing for the gospel among those who haven't followed Jesus yet. I think that is what our brothers who advocate "missional living" are trying to tell us. Rather than alienating people with a premature imperative to "turn or burn," we need to live out God's love for us in practical ways, both toward one another and toward the world at large. Certain people have a specific gift of evangelism--the ability to reach people, often people they don't know, with the Gospel. The rest of us have often been made to feel guilty because we're not that type of person. "If I can do it, anyone can do it," the extrovert on the platform tells us. But what God tells us is to be a witness for Him. We are all called to live lives of love and godliness; that in itself should provoke curiosity about the difference in our lives. The world likes to talk and sing about love; but it rings hollow--it's an emotion with little commitment. A real expression of love will be a real difference, and we all need to "always be prepared to give an answer to everyone who asks you to give the reason for the hope that you have" (1 Peter 3:15). So we all need to be ready to speak when called upon. But it begins with living lives of love, because Love Himself has given us life. 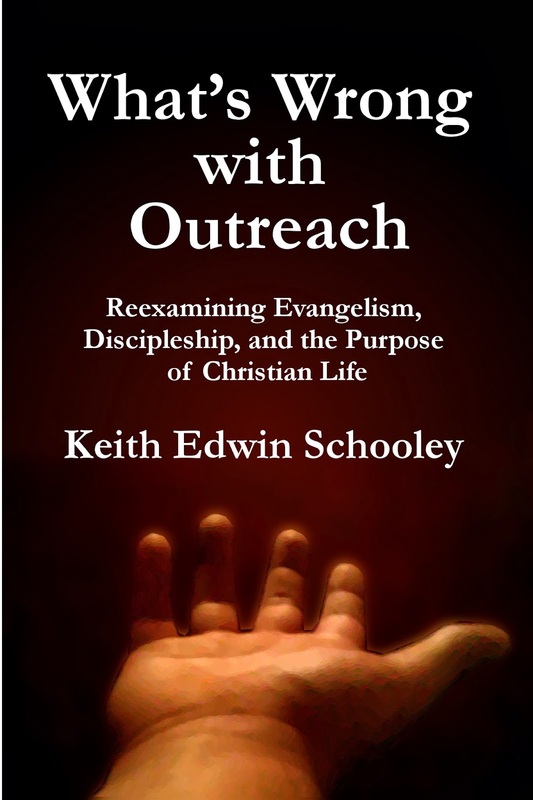 If you like this post, you may be interested in my book, What's Wrong with Outreach? As you remark, the epistles are filled with practical tidbits but never do spell out for us what gospel to share and how to share it. This has fascinated me for a long time. I think the answer is hidden because scholarship has largely failed to take account of the obvious. We have 4! gospels. I believe that each one who responded to the preaching in faith immediately jumped in to memorisisng the oral traditions of Jesus (what we now have as gospels). Gerhardson helped me a lot with this thought. So, sharing the gospel must have involved telling people these fascinating pericopes and thus bringing them to faith. The Concept of a "Redemptive Trend"